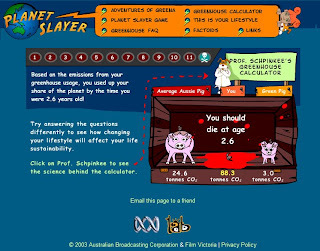 To summarize, the Australian Broadcasting Corporation has a Flash-based game on their site that lets kids find out when they should die so as to avoid hurting the planet with carbon and waste and such. It's bright and edgy and clearly geared to draw kids in. This has been written about by Flibbert, and his write-up is funny, sobering, horrifying, and dead-on. I thought I'd add to what Flibbert and Diana have said about this in the "picture is worth a thousand words" mode. Or in this case, three pictures are worth, um, three thousand words? Hey kids! Play this nifty game to "find out when you should die!" Yes, you may be spending your earnings on necessities like "eating, drinking, ... clothes, ... rent," but if you don't at least split your spending 50/50 between "ordinary stuff" and sustainable items or "ethical investments", you turn into a fat, disgusting (capitalist?) pig. And there you have it. You're decades past your expiration date. Just go kill yourself now. It's the only moral thing to do. Make sure you don't get cremated, though. Preferably have your body ground up, composted and used as fertilizer on a communal farm. And this is what I'm supposed to say to my kids? "Alright, family meeting everyone. You're 2 1/2 and 4 1/2, but you're already near or past your carbon ration. Every breath you now take and every burger you make is killing the planet. 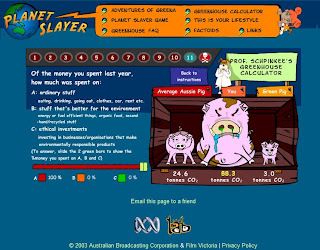 You'd better start recycling or you'll end up like that exploded pig on the computer. Wait. Why are you crying? I'm just trying to keep you from being planet killers!" 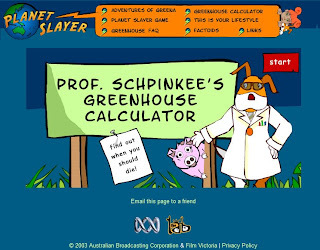 How long until PBS Kids has something like this on their website? That is sick! I looked for some kind of evidence that it's a satire. But this is absolutely disgusting. Like Rational Jenn, I found this to be so frank and over-the-top evil that it's almost hard to believe that it's meant seriously. I suppose we've gotten to the point in which this irrationality is so mainstream, more and more environmentalists will not even bother to hide their anti-man motivations. I agree with both of you. It's hard to fathom that it's meant to be real. My wife was so incredulous that she spent 30 minutes scouring the web to find out if it was real or satire. Her conclusion: it's real. It's geared specifically to 9 year olds. Apparently the web development company created it to be purposely over the top and edgy, and perhaps a bit tongue-in-cheek. I can just imagine a web development shop full of dreamy and ironic hipsters, raised drinking the environmentalist Kool-aid, sitting around a table brainstorming and saying "Hey! Wouldn't it be sooo cool if we said 'Find out when you should die!' and used an exploding pig?" What's worse is that the managers at the network saw that and thought it was OK. The main point is that all they did was stay true to the underlying premises (and sometimes overtly stated premises) of the environmentalist movement.